I’m not one for playing softball or, really, much of anything that requires running. 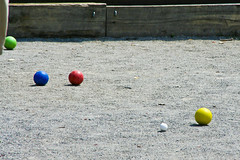 It’s not that I’m out of shape (okay, I am out of shape, but that’s not why I don’t run), but more that I think that bocce is more my speed in the summertime. Leagues are starting very shortly for the DC Bocce League with metro-accessible game locations in Columbia Heights, Capitol Hill and Dupont Circle. It’s a six-week season followed by a single-elimination tournament, so you’re not going to be overcommitted forever. Give it a shot.